RVUNL Result 2019: After the RVUNL Exam 2019, aspirants are in search of the energy.rajasthan.gov.in Result 2019. No more worries for those candidates, because the Rajasthan Stenographer Result 2019 is Out Now..!! in the Official page. As well as the direct links to Download are given on this page. Moreover, the officials of the Rajasthan Rajya Vidyut Utpadan Nigam Ltd decided to conduct further rounds for the selected candidates as soon as possible. Along with the Results, they released the Rajasthan RVUNL Merit List 2019 only on the Official site. They are also available in the form of PDF links to make the candidate’s process easier. Also, RVUNL Cut Off Marks 2019 for the attempters are given in the below sections. The RVUNL members decided to conduct furthermore rounds for the selected candidates in the next month only. As after releasing the RVUNL Result 2019, many of the hopefuls are waiting for the Personal Interview. In order to prepare well, you can check previous papers etc form the webportal. Also, check for more details in the below sections like to cut off marks and merit lists. Although the Results are released, some more candidates are waiting for the Appointment Letters. For the sake of those people, also we gave the Pdfs of the appointment orders of selected members. Candidates who haven’t received the Call letter should wait some more time with much more patience. The Board members of the Rajasthan Rajya Vidyut Utpadan Nigam Ltd has released the Cut Off Marks in this week. The candidates who are waiting for the RVUNL Cut Off Marks 2019 can check this section for the Download links. All the links given are taken from the Official site, so no need to worry candidates. Trust with us, because we give you true information only. As well as the Cut Off Marks acts as a barrier to the Qualifying process. Hence check to the table given below. The aspirants after getting the Rajasthan Stenographer Result 2019 are also in search of the RVUNL Merit List 2019. As per the notice, the officials of the Rajasthan Rajya Vidyut Utpadan Nigam Ltd has released the Merit List for the Posts of Stenographer and Junior Assistant/ Commercial Assistant-II. Also, the Merit List 2019 for other posts are released within a few days. So, after knowing the Result, candidates need to wait with much more patience. Moreover, from the table, you can get the RVUNL Merit List 2019 for some posts which are available in the PDF formats. Hence candidates may not leave without referring to this section. Next, on the right side of the homepage, you will find the Rajasthan Vidyut Utpadan Nigam Ltd and Click on it. Now, you will find the scrolling Link of Final Result For Various Non-Technical Post on the new page. Then You will find the Results Page. 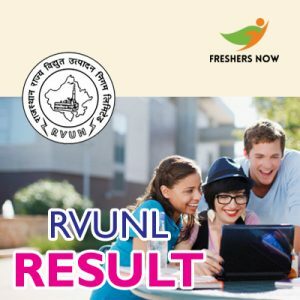 Search for the RVUNL Result 2019 and download it. You Can Also Check RVUNL Official Site To Get Further Information. Hence, Got all the details of RVUNL Result 2019. Keep visiting our website for such similar details. Also, don’t forget to bookmark Freshers Now.